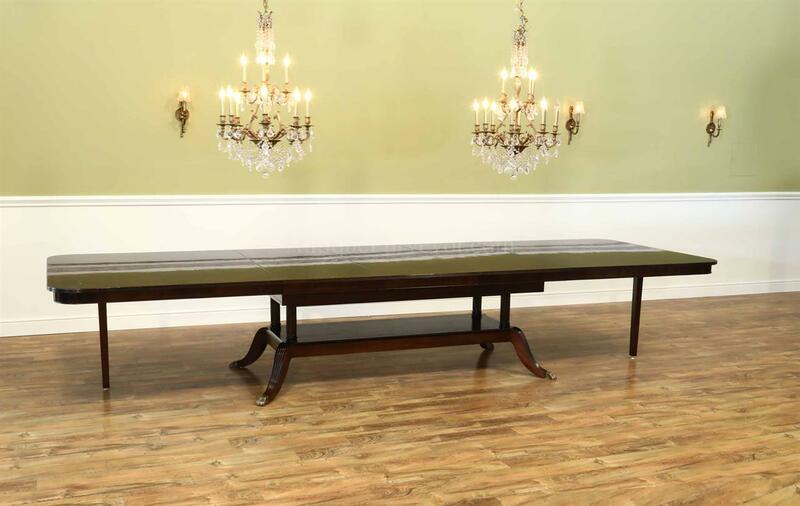 This dining table was designed to be used with with leaf most the time and two leaves stowed away. Leaf box is lined with a soft material. Expandable to 14 feet as shown here with three leaves. 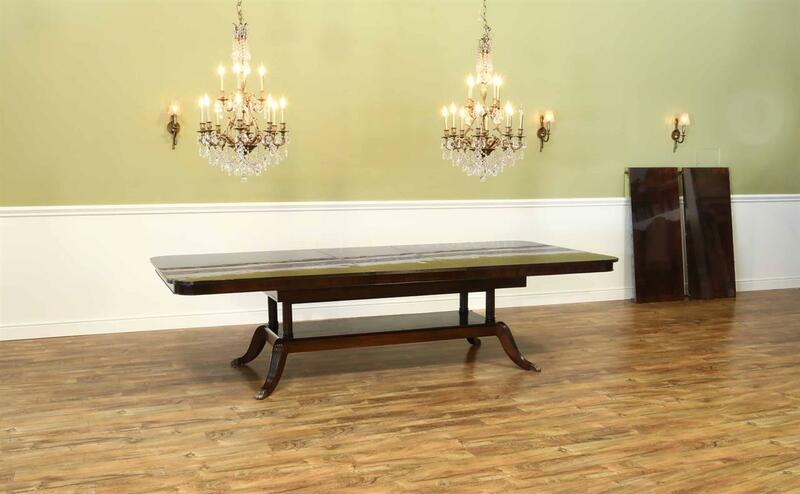 Description: Customizable American made mahogany dining room table. 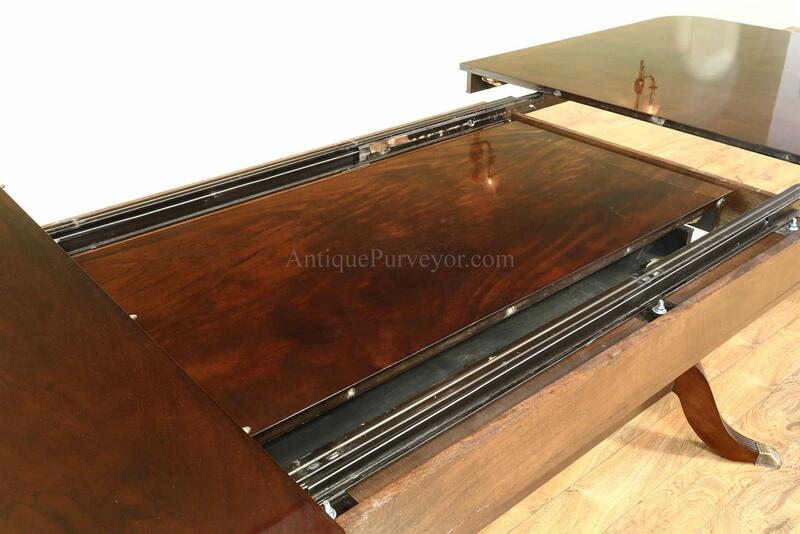 We call this a rapid expansion table because you don't need to lift the table to add leaves, the slides have cables so they are timed to open evenly and your extensions are stored under the table. 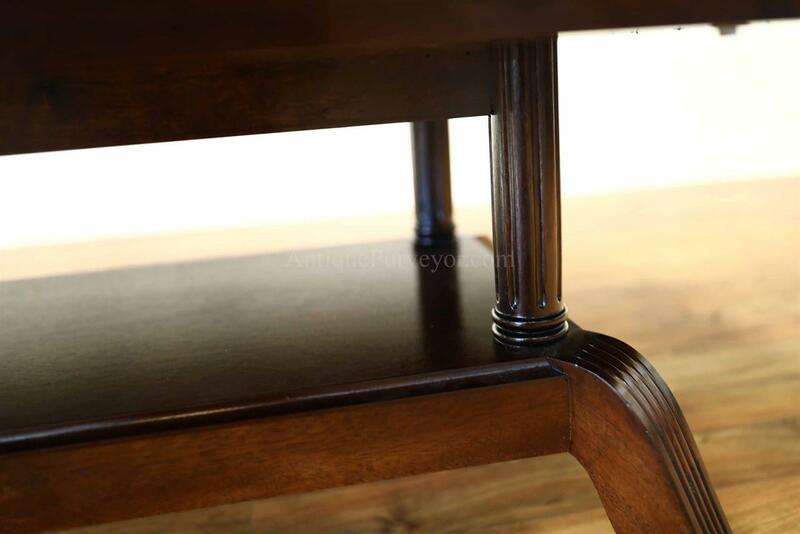 If you need to open and close your table often, this design should be a strong consideration. 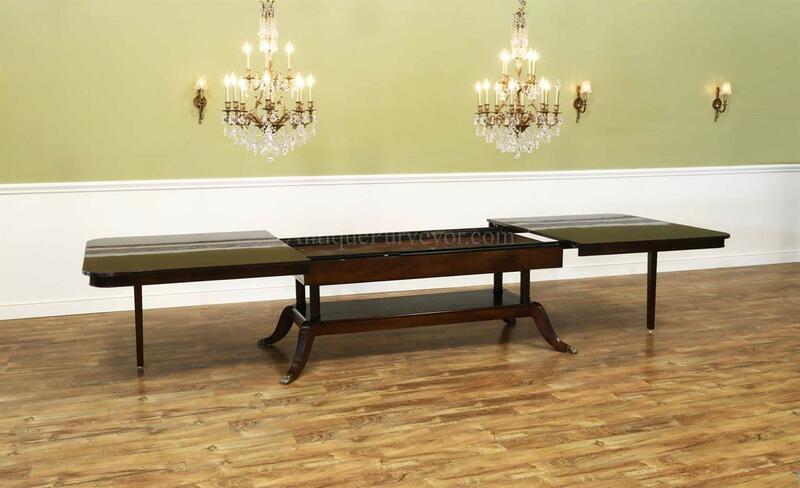 This table can be used from 8 feet long to 14 feet long with the use of three extensions. 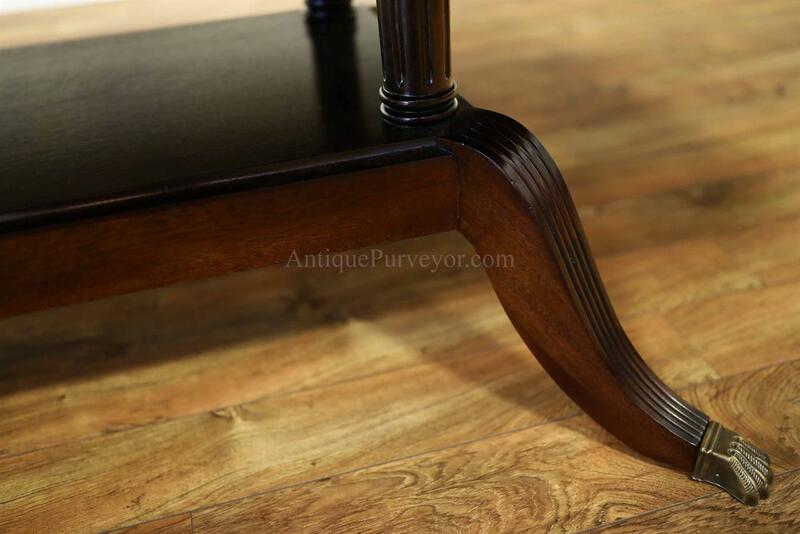 In its largest configuration, you will use the simple drop down legs to support the ends. You won't need the support legs unless you have the table fully extended. 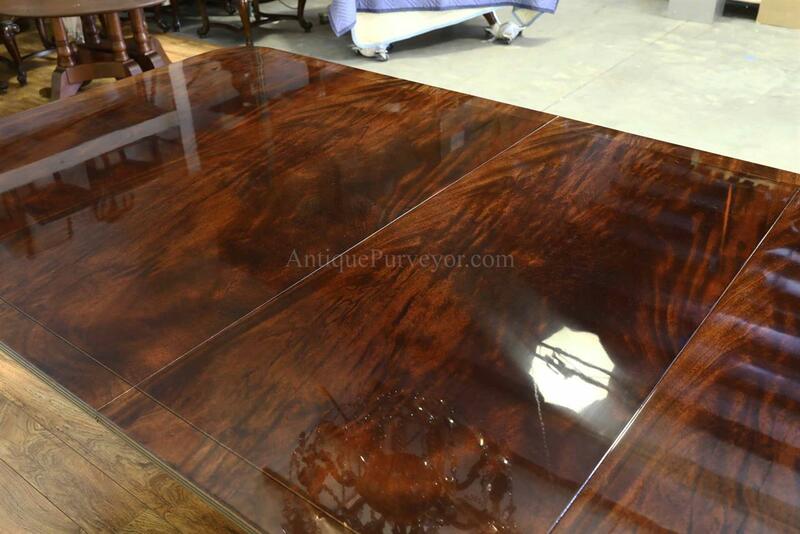 This mahogany pedestal table will seat 8 to 16 people. 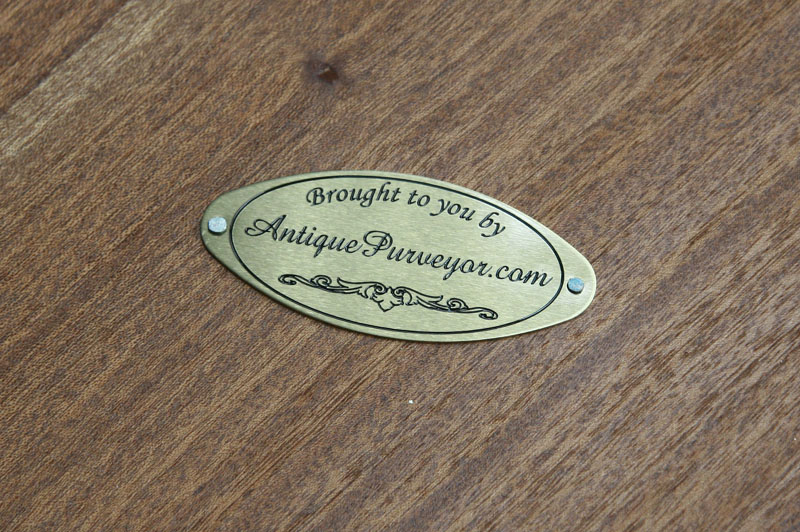 We recognize the fact that most folks who have the room for a big table like this always want one of the three leaves in place all the time, so rather than designing storage for three leaves we opted for a slicker leaf box to hold just two. This table is different. 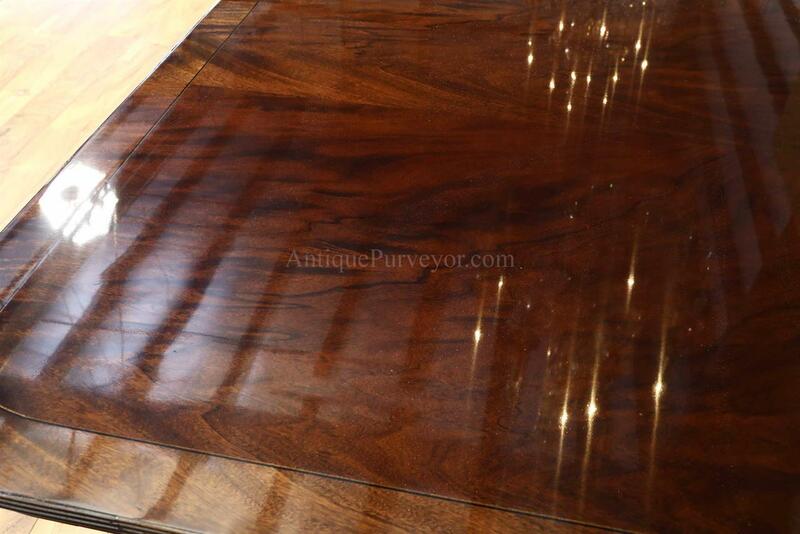 Here is a bulleted list which summarizes this table's unqiue design. 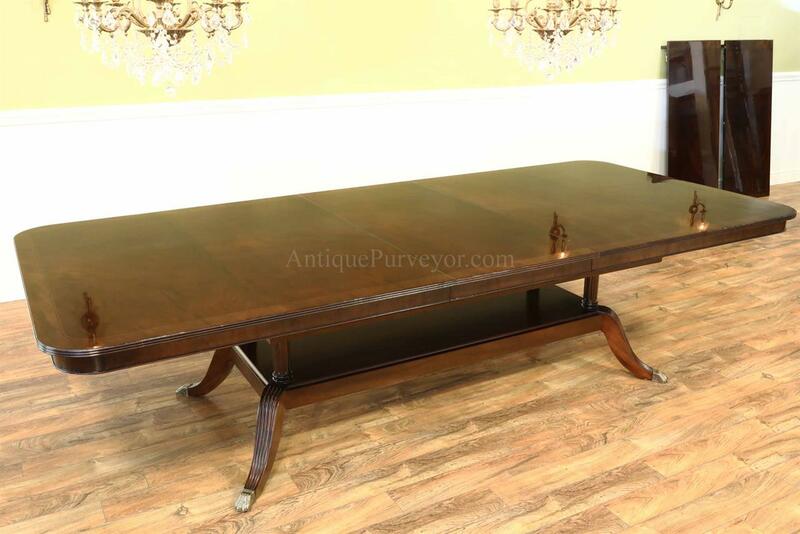 Self Storing Leaves Large banquet tables like this one rarely offer the ability to store leaves within the table. 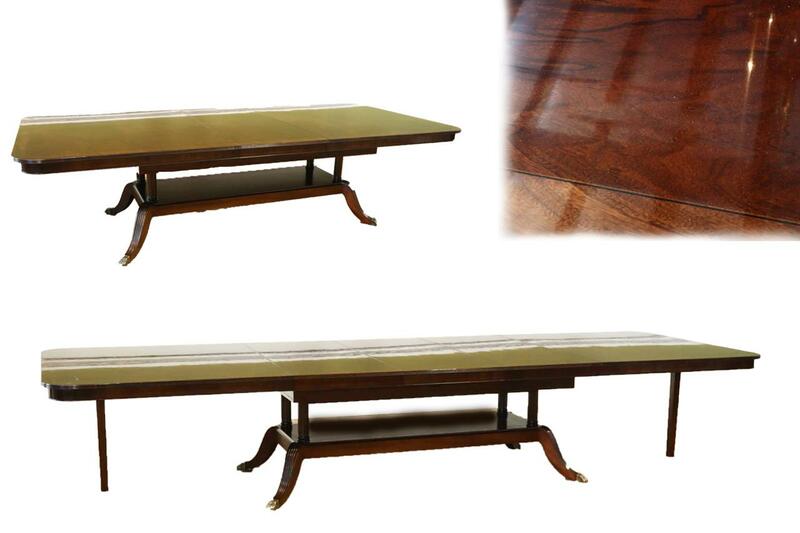 We designed this table to store two of the three leaves under the table. Single platform pedestal A single platform pedestal has a few advantages. 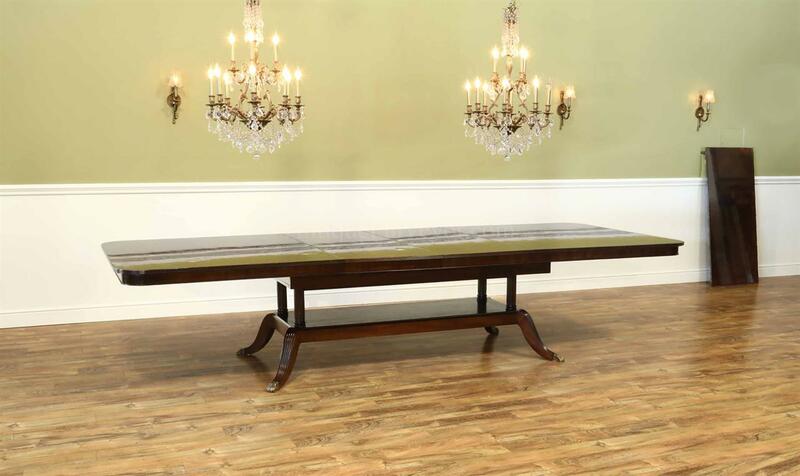 First, you don't need to lift the weight of a pedestal when expanding or contracting the table. 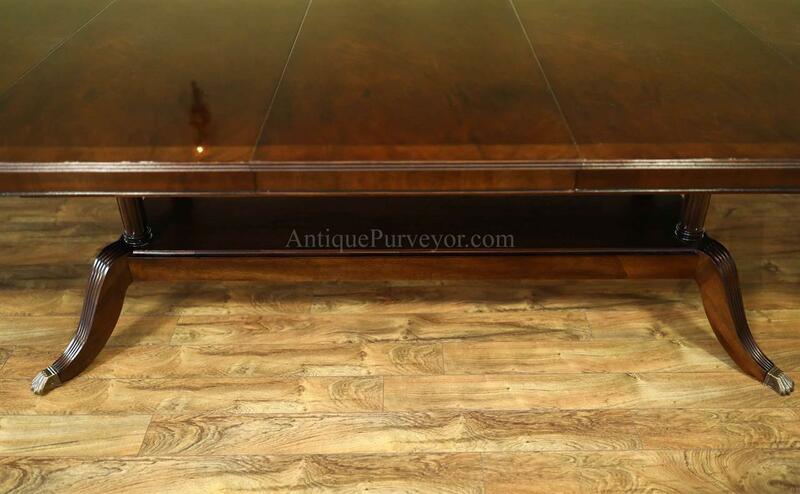 The platform pedestal will be centered in your room and there is no need to move the pedestal. 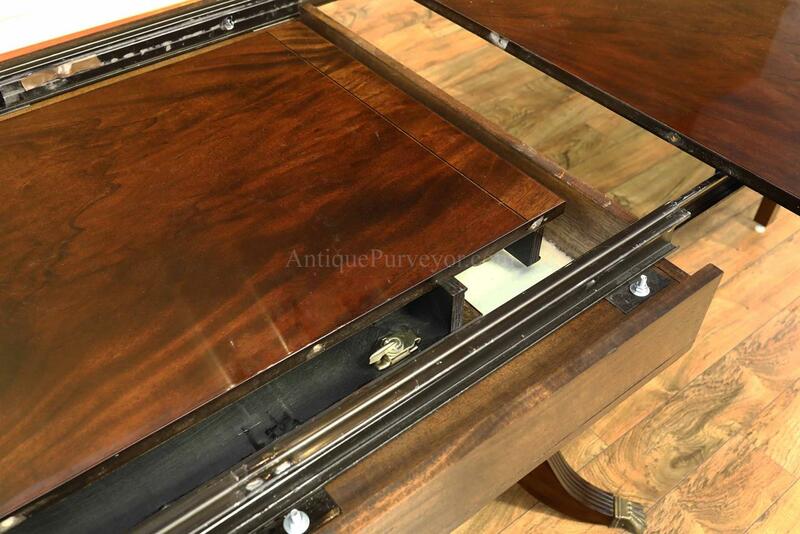 The two table ends will open evenly away from the center of the room as it opens and closes. The single platform pedestal is also beneficial because is offers the needed structure for leaf storage. 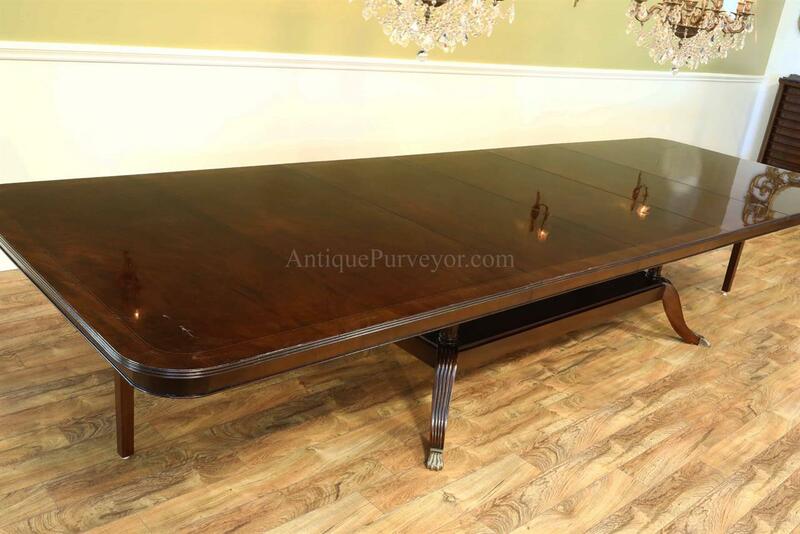 Extra dark finish We have seen a shift in demand for darker, less red and rich walnut finishes which is exactly how this table was finished. 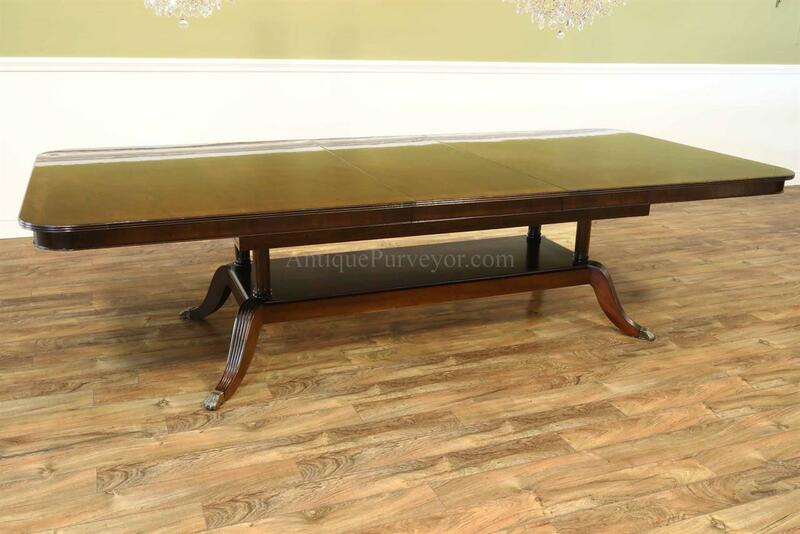 This table has a rich (dark) walnut color, but we can also do a light mahogany or ,medium walnut.